With a motion and activated camera, two way audio and HD camera, you can see, hear and communicate with your visitors in a real time and never miss them. 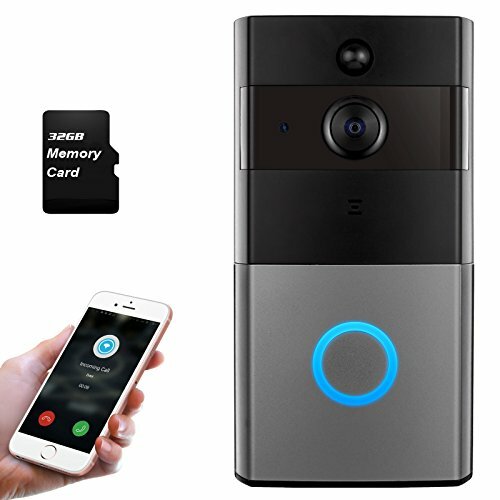 Two 18650 batteries can be worked for 8-12 months compatible with IOS or Android, you can control the doorbell on your phone and set many functions you need. Why choose Mbangde Smart WIFI Doorbell? Never to worry you will miss a visitor unexpected and you can control all on your phone even if you are out. Easy installation - We have detail steps in the user manual, 5 steps to get. We main to keep our house safety and upgrate the traditional door, truly protect the convenience of customers. Two-way talking with noise cancellation let you can see, hear and communicate with your visitors. Connect with your cellphone enables you to add and remove up to 21 doorbells on the software as well as adjust many functions on the doorbell. Easy Installation - No wires and cables are required. Just put the doorbell on the wall and connect your phone (total 8 steps). Say goodbye to tradition - with good looking appearance, keep your home security and bring you the maximum convenience. 5M night vision and waterproof - Whatever rain or shine, day or night, you can watch or photography the video in your home. If you have any questions about this product by Mbangde, contact us by completing and submitting the form below. If you are looking for a specif part number, please include it with your message.